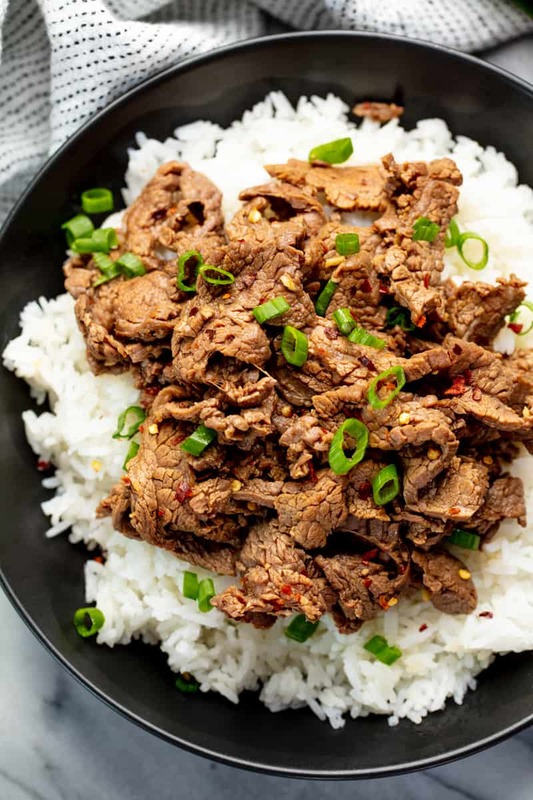 15 Minute Mongolian Beef is full of flavor and super easy to make. In the time it takes to cook rice, you can have delicious restaurant quality Mongolian beef ready to serve on top. What cut of steak should I use to make mongolian beef? 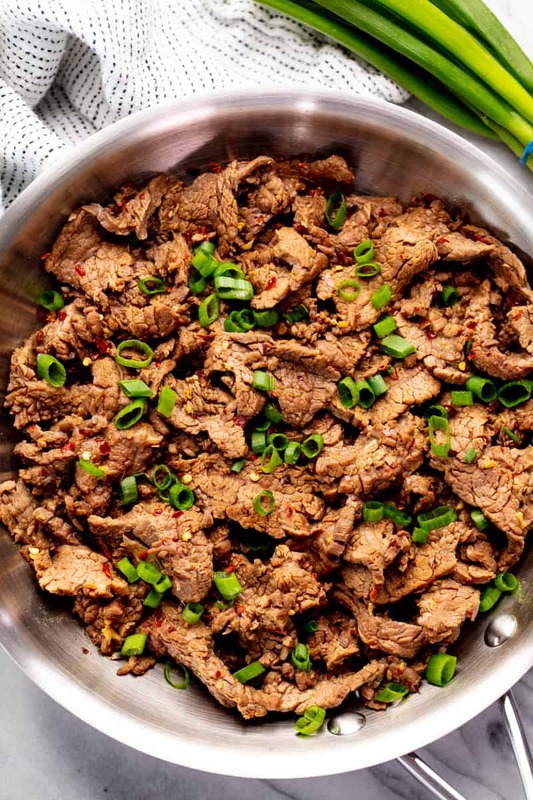 We recommend using flank steak when making Mongolian beef. You can also use skirt steak. Each should be sliced thinly against the grain. This cut will cook quickly and soak up the flavors of the marinade. You could also use traditional cuts of steak like sirloin, ribeye, or strip steak. What does it mean to slice the meat against the grain? When you look at a cut of beef, you can see lines in the muscles which is called the grain. This grain is particularly easy to see in a beef cut like flank steak. The grain provides a natural breaking point in the meat. Slicing against the grain means to cut the meat perpendicular to these lines. This will provide the maximum number of breaking points in the meat, giving you a tender easy to chew piece of beef. If you slice the meat parallel to the grain, you won’t have those natural breaking points in the meat, which means you’ll have a tough, chewy piece of meat. Slice the flank steak against the grain into long strips. Put the strips into a medium-size mixing bowl. Stir in soy sauce, hoisin sauce, sesame oil, brown sugar, garlic, and red pepper flakes until meat is evenly coated. Heat a heavy skillet over high heat. Add in the olive oil and sear the meat until desired level of doneness is reached (2 to 3 minutes for medium rare). Top with green onions (optional). Serve hot over cooked rice or rice noodles. Enjoyed this for dinner tonight. Thanks for this great recipe…will be adding it to my rotation. Wow ..Only 15 minutes !!! Really a nice posting ….!!! I will definitely share it with my family……!! please keep up your fabulous posting…!!! Oh my, this will be the best 15 minutes that I will spend during the day, well, except for the next 15 minutes when I am eating it. This will be tonight's dinner.